A over-sized (2,000 Sq Ft)3 BR, 2 Bath home with an extra large electric heated pool and lanai. The view is incredible. The home is at a canal/basin intersection. A short boat ride to the Gulf of Mexico. Completely decorated with all the amenities you would expect. A dock you can tie off too. Our Home is at the end of a very quiet street. Quick access to the river (2 Directions). No backyard neighbors like most canal homes. Free High Speed WIFI, Xfinity Television. 4 Televisions! ***Quiet*** and Large Canal/Basin Intersection! You can hear your neighbors and they can hear you on most canal homes because the canals are not that wide. With our location that is practically eliminated! Gulf Access from two different Locations. 20-25 minutes to the River. Number one is the location. You can access the river from two different locations in less than 15 minutes. From there you are only 15-20 minutes from the Gulf. Some homes are so far in that it could take 45 minutes or more to get out of the canals. Our home has a huge 2,000 square lanai/pool area. The pool is oversized and has a little bar table in it. The lanai has a stereo system, shower, two bedroom access and bathroom access. The master bathroom has a large walk-in shower Jacuzzi tub and is separate from the other bedrooms. We have a large screen TV in the family room and cable TV in all three bedrooms. DVD in the family room with surround sound. Our house includes everything you would expect in a house. Some of the items included are a kitchen stocked full of dishes, cups, silverware, pot and pans. There is a coffee maker, blender and microwave. Bedrooms are equipped with linens, TV's, dresser, alarm clocks. We provide bath towels. There is a washer and dryer for your use. We stayed almost 3 months - Mid December to March 1st. It was an amazing house and we are so very grateful for the understanding and awesome owner. He worked with us as I was scared of renting site unseen. He had his mom take photos because I was afraid of red tide. Everyone we possibly needed was in the house so I brought way to much stuff. It was just perfect and I hate to leave. You will never want to go home after staying at this house. Its about 30 minutes in our pontoon boat to the river but the ride is scenic and very enjoyable. The view is outstanding and I felt like I lived on the porch. Plenty of chairs for friends. Everything worked. Pool was terrific! Can't say anything bad. I hope all VRBO houses are this wonderful!!! Standard has been set high with this one. Thank you so much for the kind words. It's renters like you guys that we dream of. It was such a pleasure having you guys. Thanks again for staying with us! Amazing! The home was beautiful, great pool and spectacular view! This was my first vacation home rental and I was so impressed. The home was exactly what the pictures showed. It’s in a great location, close to all kinds of shopping, places to eat and the beach. The layout of the house is perfect for pool and water views 24/7 and the home is well maintained with weekly pool service and grass cutting. Also, I found it great to be able to also sit on the dock and watch the fish jump and have my morning coffee in such a quiet setting. Over all I give this home a 10 out of 10, the hosts were great at communicating all the details and my arrival and key retrieval was was seamless. I will definitely rent this home again! Thank you Bill and Lori for letting me use your beautiful home! Ps if you rent this home, try the Merrick Seafood Market...awesome! Incredibly kind words. We appreciate that very much. Our Pleasure! We can only dream of having renters like yourself every time. Everything you would need in a Rental Home! All of the pictures were very representative of the house. I loved their personal web site. The house had everything we needed (Linens, Towels, Kitchen items, K-cup machine) Very Quiet and relaxing location. Because of the big canal, no backyard neighbors to hear. Bill was very responsive and easy to work. We would definitely come back and we are looking forward to it! Thank you very much! We appreciate you staying at our home! 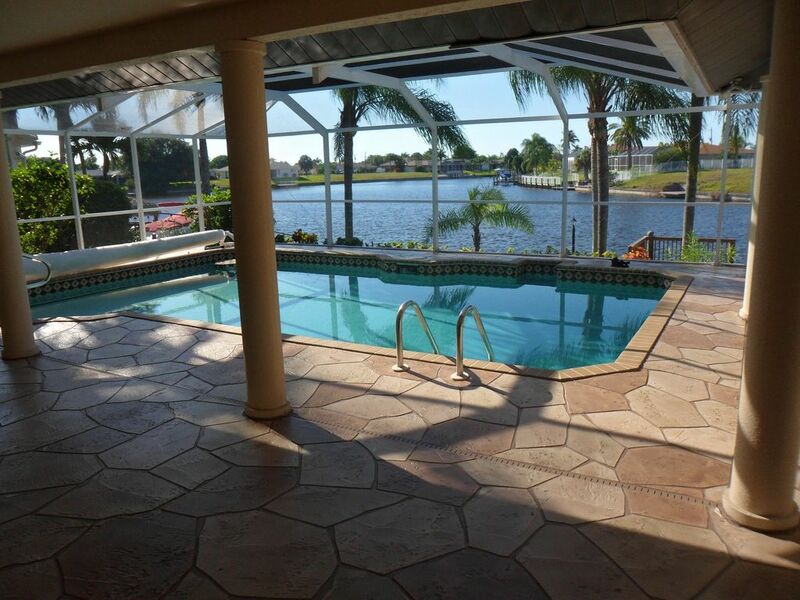 We were very impressed with the house in Cape Coral. The layout was perfect for us and our 2 teenage boys. It was wonderful to wake up and be able to go for a swim first thing in the morning. This home is in a very quiet neighborhood and is very relaxing. Every room in the house except one has ceiling fans which make the house extremely comfortable without having to blast the air conditioning. This was the second time we've rented this home. The owners are prompt with communication, honest and very organized. The home has loads of space and is ideal for a family. The pool alone is worth the rental. Sitting on a very quiet canal allows for a phenominal view and feel. Fantastic value for the rental price. Our visit to Cape Coral was wonderful due in large part to our accommodations. The home was beautifully maintained and Bill and Lori were the "Hosts with the Mosts!" The directions we received about everything from how to heat the pool to the recommendations for restaurants and attractions were on point. The basics like grocery stores, banks and drug stores were easily accessible because the home is on a main street, but not too close. The home is simply wonderful, VERY CLEAN and we felt right at home. The pictures do not do it justice. The beds were comfortable and the pool was amazing. Everything we needed from a skillet to fry eggs to beer mugs were made available to us and we were very appreciative to Bill and Lori's attention to detail. While we were there we encouraged people to arrange to stay there because it was so wonderful. Even now, we are still saying that our vacation was the best we ever had. The beaches are within a half hour of the home and are surprisingly tranquil. We enjoyed a relaxed lifestyle and our only regret is that we didn't have longer to stay. We spent a lot of time on Sanibel and were quite happy that although Sanibel is amazing, that we had Cape Coral to call our home. The Green Flash, one of Bill and Lori's recommendations is home to the best grouper in the area. We missed the Bubble Room Restaurant on Sanibel, but look forward to going back to enjoy it. Fort Myers Beaches are also a treat and well within distance to spend the day. The home was close enough to Orlando (about 3 hours away) but far enough away to make a drive up there to visit Disney World and Kennedy Space Center "do-able". The drive on 75 was easy and not a problem. There is a water park near the home for children and although we didn't visit it, we talked to others who visited it and enjoyed it very much. The Edison/Ford Estates is a must visit. It gives you a peek into Old Fort Myers and the grounds were beautiful. Go visit Fort Myers/Sanibel for fun and stay at Bill and Lori's! water park that is not far away. There is a ecological preserve. number and variety of courses that are near. Of course beaches are plentiful. There is a beach in cape coral. adventurous you can continue on to Captiva Island. Boating is one of the most popular pastimes on the Lee Island Coast. a tour. Remember we have a dock. Your deposit (minus the $175.00 cleaning fee) will be refunded around 30 days after you checkout. The only exception to that is if you cancel your reservation and I can’t find anyone to rent your weeks.